What were the most popular anime series of 2018 around the world? 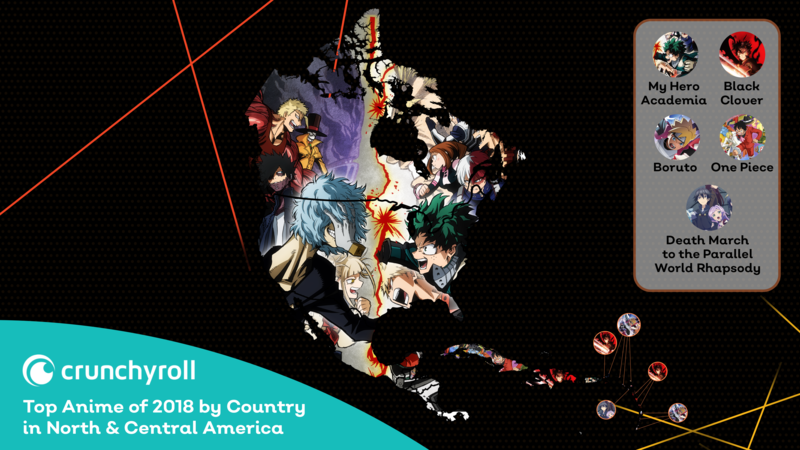 Let’s find out on our globe-spanning quest to list out the top anime of 2018 by country! As 2018 comes to a close, it’s a good time to reflect on all the amazing anime we got to watch this year! 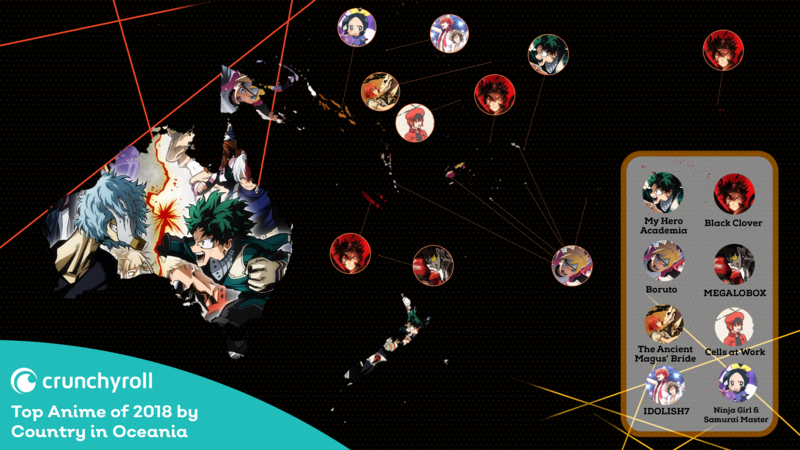 In keeping with our tradition of sharing maps of Crunchyroll users’ favorite anime, we decided to go all out and show each country’s most-watched anime for all of 2018! Which 2018 anime dominated the charts where you live? Join me as I do my best Miles impression and let’s find out! A quick note on methodology: this map is looking at which show has the most current viewers from a sample as of the most recent episode by country. Shonen is the name of the game in North America! It’s the UNITED STATES OF SMASH with the US, Canada, Mexico, Costa Rica, and Puerto Rico all aboard the My Hero Academia train! Our other shonen heavy hitters refused to be left behind–Cuba favored One Piece this past year, and BORUTO: NARUTO NEXT GENERATIONS was the anime of choice for the vast majority of Caribbean nations and territories, including Jamaica, the Bahamas, and Trinidad & Tobago. Meanwhile Black Clover took the throne for Haiti, Dominica, Guadeloupe, and Martinique. Montserrat carved its own path with the “another world” anime Death March to the Parallel World Rhapsody clocking in at number one. Deku and Boruto were the top contenders in this region, and with good reason! 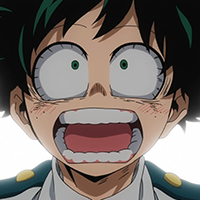 The third season of My Hero Academia sent shockwaves through the anime community with its amazingly animated fight scenes and precisely written character drama! BORUTO: NARUTO NEXT GENERATIONS continues to be a delight, both conserving what we loved about its parent series and bringing a whole new magic to its world. One Piece and Black Clover had respectable showings too, and it’s certainly interesting to see shonen’s strongest newcomers alongside a genre defining titan. 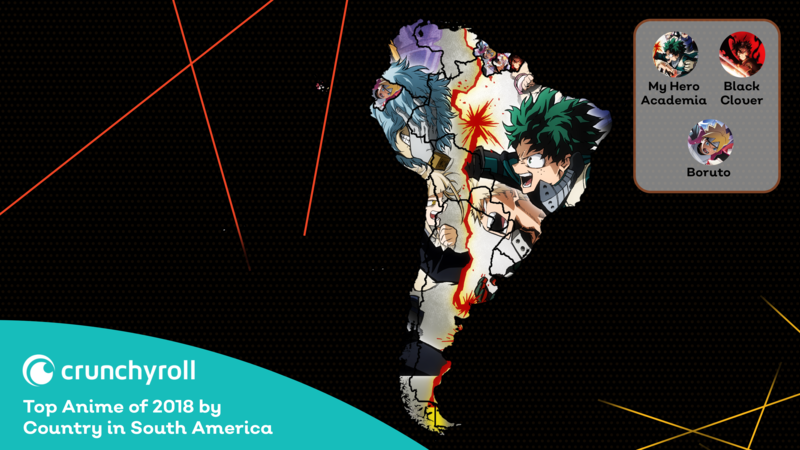 South America followed largely the same trend as its neighbor to the north, with My Hero Academia claiming a huge majority of the continent, giving us an almost unbroken South America-shaped poster of Deku squaring off with Shigaraki. Ecuador, Guayana, and Suriname all championed BORUTO: NARUTO NEXT GENERATIONS, while French Guiana was the hold out with Black Clover. Ah, the first appearance of 2018 fan sensation DARLING in the FRANXX! Zero Two and Hiro’s visually stunning mecha romance took a sizable block of countries stretching from Russia down to Poland. The series was the talk of AniTwitter at the start of the year, and soon gained a pretty impressive following thanks to some absolutely masterful direction and animation! Shonen stalwarts My Hero Academia, Black Clover, and BORUTO: NARUTO NEXT GENERATIONS take up most of the remaining area on the map, claiming Germany, Spain, and Turkey respectively (among others). Dragon Ball Super makes, oddly enough, its only appearance in Croatia, the one country where Goku’s continued journey reigns as number one. Regardless of its standing on the map, this continuation of the Dragon Ball series was the talk of the anime community up to (and after) its season conclusion in March. It’s not often that a series causes this wide of an impact, and watching Goku reunite with the rest of the cast along with millions of other fans was something truly special. A fun note: this is the first (and, surprisingly, not the last) map without shonen megahit My Hero Academia! 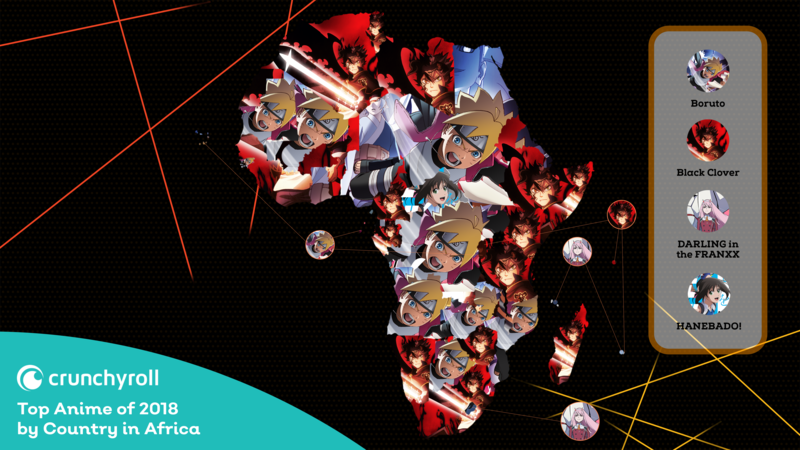 Africa was pretty well split between BORUTO: NARUTO NEXT GENERATIONS and Black Clover (besides a surprising twist for one country). DARLING in the FRANXX managed to snag Comoros and Reunion off the Eastern coast, as well as Lesotho further inland. Wizard King contender Asta was favored in the majority of coastal countries like Senegal, Somalia, and South Africa, while the son of the Hokage was the top show for a large swath of nearly contiguous countries ranging from Egypt in the North to Botswana in the South. Nearly contiguous because of the delightful surprise of HANEBADO! in the Central African Republic! HANEBADO! was a sleeper hit from the summer season that boasted some absolutely gorgeously animated badminton action and the dramatic narrative chops to match, and I’m equal parts surprised and delighted that it showed up here! 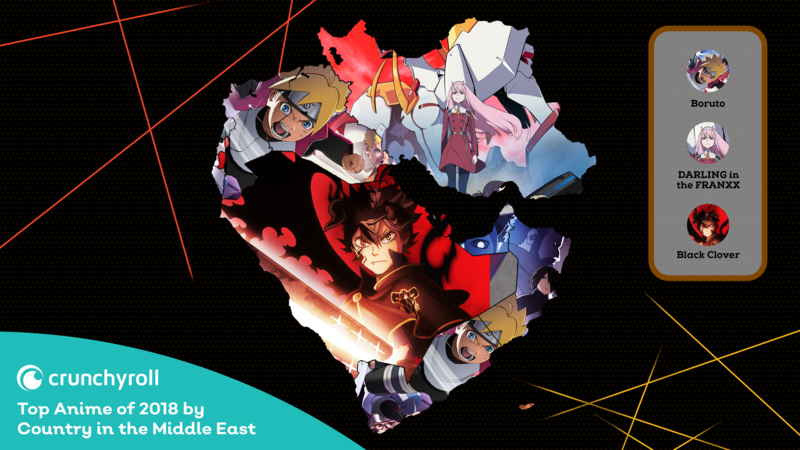 BORUTO: NARUTO NEXT GENERATIONS won the Middle East in terms of sheer number of countries, laying claim to Iraq, Israel, Jordan, the United Arab Emirates, and more, but DARLING in the FRANXX took a large swath of the region with Iran. Black Clover didn’t take things sitting down either, with Saudi Arabia and Qatar giving us a nice big portrait of our favorite magic-deficit underdog. Heavens, look at the time! It’s BORUTO O’CLOCK!! Nearly every single country in Asia had the ninja adventure series as their top show, giving us a slightly haunting multitude of determined young ninja faces comprising almost all of the continent. There was one particularly interesting upset–the girls love romance series citrus won the year in The People’s Democratic Republic of Korea! The yuri title was relatively popular in the US at the time of its airing, but this marks its debut thus far on our worldwide journey! Our world tour concludes with the wonderfully diverse anime tastes of Oceania! Australia, New Zealand, and American Samoa all joined the cry of “PLUS ULTRA” with My Hero Academia. 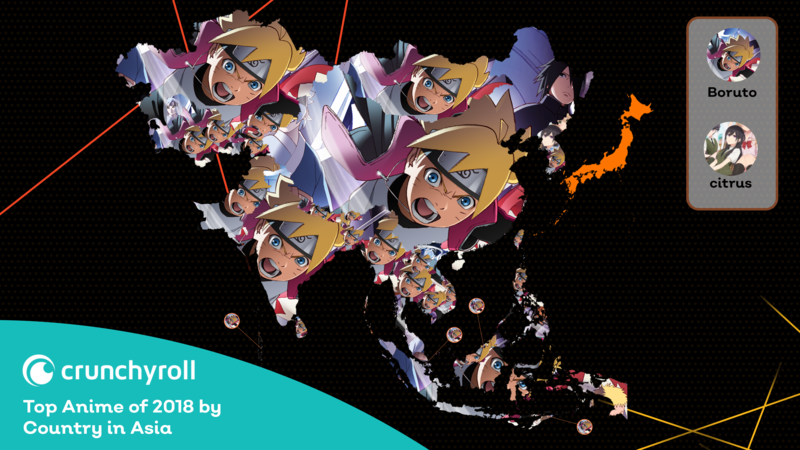 Guam, French Polynesia, and New Caledonia were all enchanted with Black Clover, and 2018 mainstay BORUTO: NARUTO NEXT GENERATIONS claimed a vast majority of countries including Micronesia, Fiji, and Papua New Guinea. But here’s where the real fun starts. Critical darling MEGALOBOX fought its way into the hearts of Norfolk Island viewers, Nauru sang the praises of IDOLiSH7, while Tuvalu was taken with Cells at Work! and its infectious charm. I apparently share tastes with our viewers in Kiribati, as we both agree that the lovely coming of age anime the Ancient Magus’ Bride deserves a seat at the top. Finally, the Solomon Islands come in with a big surprise as the snappy and cute Ninja Girl & Samurai Master snags number one. And there you have it! 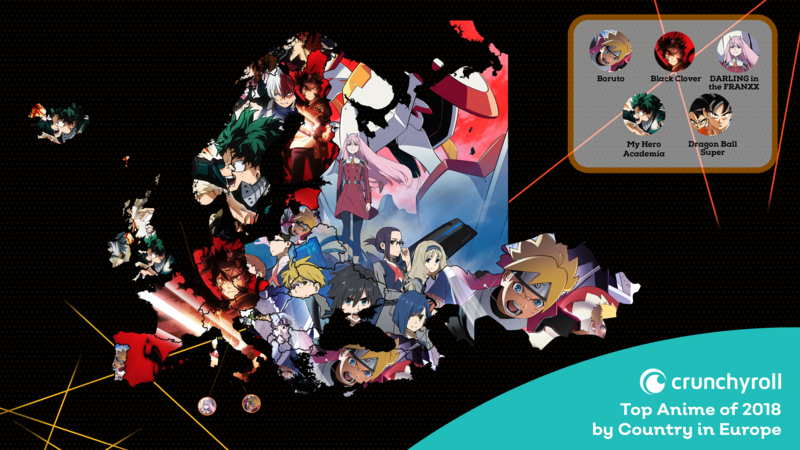 A year’s worth of worldwide anime viewing on Crunchyroll laid out by country. There’s something really special about seeing different countries’ favorite anime, and we hope you felt as connected to the global anime community reading this as we did creating it. Thank you for reading, and let us know if your top anime of 2018 ended up on any of the maps! We’ll see you again next season for our regularly scheduled seasonal maps, so, until then, happy holidays!